Research update – PhD student, Ali McCarron. An important step in bringing our airway gene therapy to clinical trials is generating the large amounts of gene vector needed to dose human sized airways. With the installation of this bioreactor, we can now develop methods that will enable us make our vector at the quantities needed for clinical trials. Once these methods have been established, we can pass them over to a commercial partner who will produce the gene vector needed for human use. 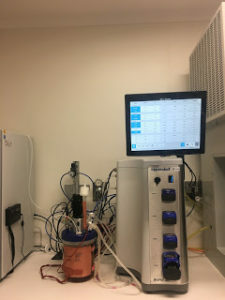 The generous funds donated towards the purchase of this bioreactor will help hugely in accelerating our progress towards first-in-human airway gene therapy trials in patients with cystic fibrosis.